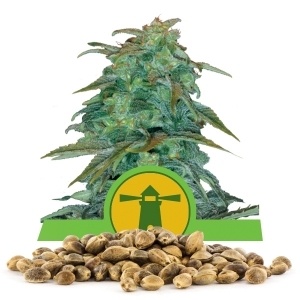 Royal Dwarf is a special little plant that is easy to grow, quickly delivers a large yield for its size, and produces a intense strong smelling and strong tasting herb with a powerful effect. 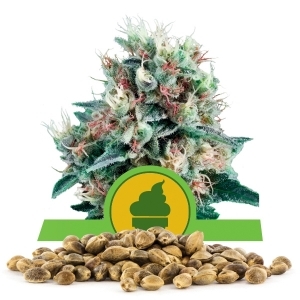 A little goes a long way with Royal Dwarf, as this little herb plant gets a "Big Stone Award" for its potent effect on the body and mind with 13% THC. 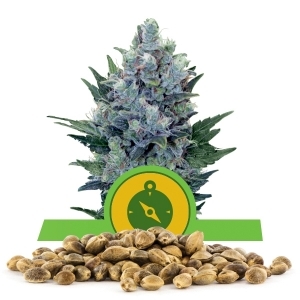 Royal Dwarf is an optimal choice for those who suffer from insomnia or the discomfort of sore muscles even though it has a low CBD rating. 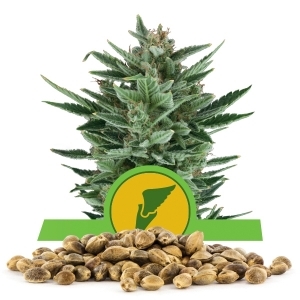 Royal Queen is pleased to offer Royal Dwarf seeds in bulk as well as traditional packages of one, three, five, and ten seeds. 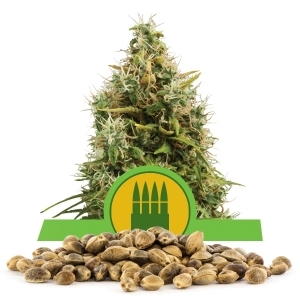 Growers adore the Royal Dwarf for its pretty bonsai-like compact structure with tight buds that makes for easy growth indoors as well as small outdoor landscape designs. 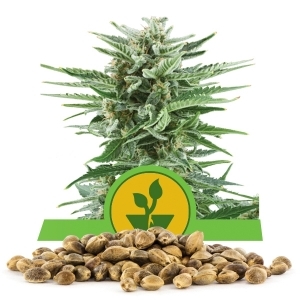 They also love the fact that Royal Dwarf is an auto-flowering variety that takes only six to seven weeks to flower and is ready for harvest in only eight to nine weeks after sprouting. 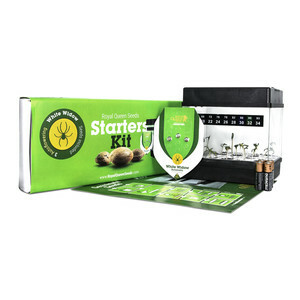 Growers rave about the rapid germination and quick growth rate of Royal Dwarf. 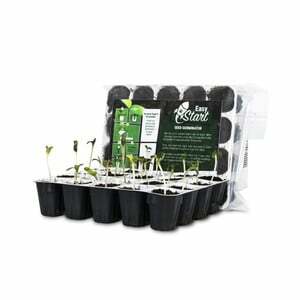 This mighty little plant has been successfully grown with eight high-powered florescent light bulbs. Royal Dwarf's quick and compact growing habits make it a perfect companion for crops that take longer and bring larger yields. 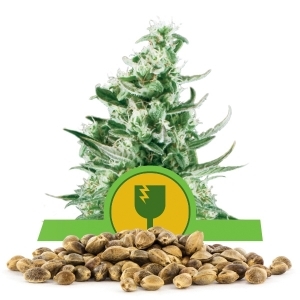 Indoor growers will see between 40 to 70 centimeters of height with Royal Dwarf, and yield between 150 to 200 grams per meter squared, while outdoor growers will see 50 to 90 centimeters in height, and receive 30-80 grams per plant dried. 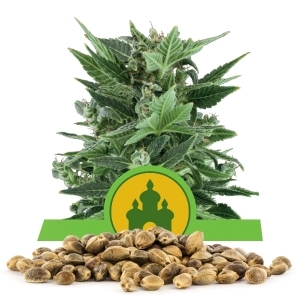 Royal Dwarf has a potent and complex genetic makeup with a crossing of Skunk and Ruderalis. 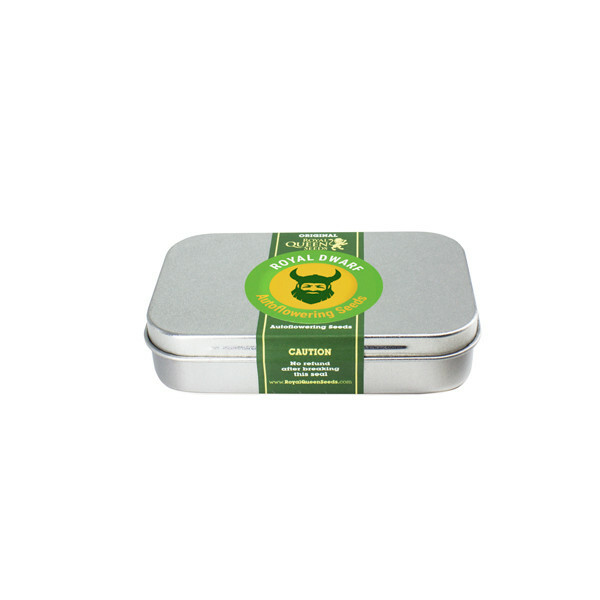 It is 60% Sativa, 10% Indica, and 30% Ruderalis. 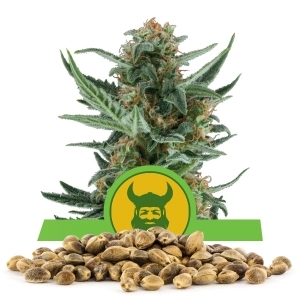 This potent blend of qualities brings Royal Dwarf a mighty punch to a small package. 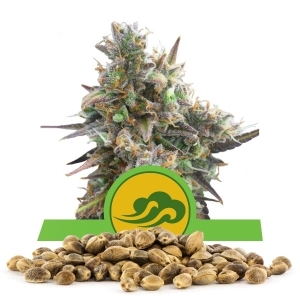 The Skunk heritage of Royal Dwarf gives it a very strong aroma, hard resin-covered buds, and the quality of experience that makes Skunk cannabis famous.